Lafaza’s co-founders, Nathaniel and Sarah, hadn’t given too much thought to vanilla until the Peace Corps brought them to the forested northeastern Mananara-Nord region of Madagascar. Madagascar produces 70-75% of the world’s vanilla crop, but in this remote region, the vanilla growers were so cut off from trade that they had no control over their market destiny. Collectors working with larger exporters would walk into the villages and dictate the low price they were willing to pay for the crop. In the two years before Sarah and Nathaniel had arrived, the vanilla market had spiked and then crashed, causing much hardship in the area. The people suffered, unable to fulfill their basic needs; things we take for granted such as access to clean-running water. For their Peace Corps mission Nathaniel and Sarah were challenged to help the vanilla growers in their region reach international markets. Vanilla is an orchid vine that grows in densely forested environments. A native tutor tree is planted next to the vine and cultivated to have many small branches that the vanilla vine can loop up and around before returning back down to the earth to re-root after each new growth cycle. Mature vanilla vines have ten or twenty loops that are each rooted into the ground. There are no natural pollinators for vanilla in Madagascar. Each flower has to be hand-pollinated by a farmer and each flower produces only one bean. Even the process of hand-pollinating the flowers is an art. The wrong amount of pressure applied during pollination can lead to a malformed bean. The vanilla farms are so close to one another that during the flowering season you can hear the growers bragging to one another about how many flowers they have. The vanilla crop will have to sustain their family for the next year; a bad yield could be disastrous. The curing process that follows is as important as the cultivation. A great vanilla bean can be ruined by poor curing. The beans are laid on a cloth in the sun for two to three hours a day, and then the cloth is rolled up so that the warm beans can sweat overnight. This process is repeated daily for two to three months. Teams of women sort through the beans every day, pulling the ones that are fully cured, and sorting by quality. The beans are then brought inside to dry down on wooden racks until they are perfectly cured. The A-1 grade of vanilla beans will be sold to customers looking for soft fragrant whole beans for pastry and confectionery applications. Smaller dryer beans will be sold as manufacturing or extract grade. Some less scrupulous producers will vacuum pack half-cured vanilla beans to sell for cheap to international markets. When vanilla beans are packed “wet,” they can become moldy, and the vanillin content of the beans will suffer. 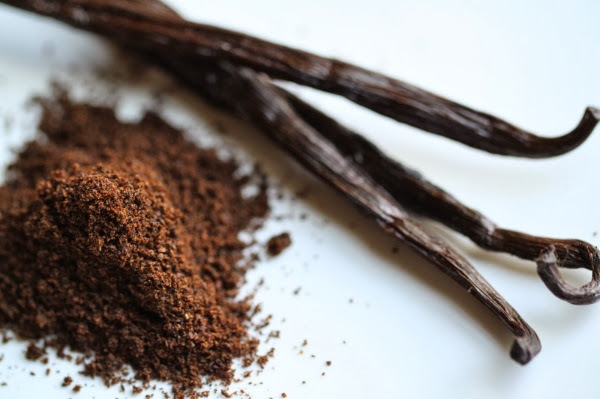 The vanillin compound is the flavor and aroma we associate with vanilla, but good vanilla beans contain 250 active compounds, each contributing to the sublime, nuanced flavor. Many of these flavor compounds are only brought to fruition during the curing process. When Sarah and Nathaniel were in Madagascar they lived in a small house just off of the Indian Ocean. During the vanilla season they would wake up to the smell of vanilla mixing with the salty breeze coming off the ocean. Nearly everyone has at least a few vanilla vines growing in their front yard, and so vanilla beans were being cured literally right outside their window. Interestingly enough, vanilla is barely used by locals. As one farmer told Nathaniel, “Americans love their vanilla, and I love selling it to them.” The vanilla farmers had assured Nathaniel and Sarah that they had a great product. But having no background in the vanilla business, they had no idea how good the product was until they sent some samples back to the United States. Through a contact of Lafaza Co-Founder (and Nathaniel’s brother) James, they were able to get their beans into a blind tasting with a major American chocolate producer. Their beans were picked as the top choice. Sarah and Nathaniel exported a hundred kilo (220lbs) pallet of vanilla beans a few months later, which were imported by James in Oakland, CA, and the Lafaza team has been doing it ever since. When Nathaniel, Sarah, and James looked around at the standing business model for vanilla, they saw that it was not being done in a way that was putting farmers in a central, beneficial or inclusive position. They thought it would be worthwhile to start a business that fairly rewarded all points of the supply chain. Their approach to working with the vanilla growers is that they are not only trading with the farmers, but also providing support for sound agroforestry practices and crop diversification. Their farmers get higher prices for their vanilla, and Nathaniel and Sarah give back to the villages by building libraries, and community centers. At Great Ciao we are selling Lafaza’s grade A-1 whole beans, as well as their pure ground vanilla bean powder (both pictured above.) The beans are pliable and aromatic, and are without a doubt some of the finest we’ve worked with. The pure ground powder is made by taking the driest beans possible and grinding them up. Much of the vanilla bean’ flavor is in the pod itself, and by using the ground beans you can unlock all of the potential in the beans. Have questions about the product or pricing? Give us a call at612.521.8725 – we love talking about food!